Neil Warnock couldn’t hide his low spirits in the pre-Peterborough press conference. He covered the defeat against Blackpool, changes he’ll bring in for Oxford, our inability to sign anybody on a permanent deal, let alone compete with promotion-hopefuls, and our reliance on the loan-market from now on. 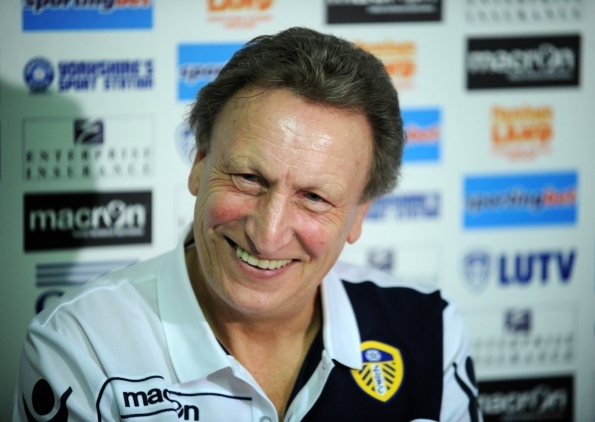 Nevertheless, Warnock is determined to do his best with what he’s got. I talked to Nigel Clough at the reserves match yesterday and there’s no easy game this season. Every game could be anybodies. We can talk about Peterborough, but can you imagine their dressing room? They’re going to die to win on Saturday. Are we favourites? Are we hell! I watched Peterborough last year a few times and they’re a good side. There’s no such thing as an easy game at the moment and we’ve got to start with giving 100%. If you get beat by a better team you’ve got to take your hat off to them, and Blackpool were better than us. I’d love to bring 3-4 top class players in, make no mistake about that. I could even tell you 3-4 right now. I even enquired about one yesterday [Wednesday] but… [shakes head] another Championship club’s offered him a lot more than we could afford even if we were in the market. We are up against it in the League this year because if one of those 5-6 teams that are splashing money around come in for players then we aren’t going to be able to get them. Peterborough is a hard place to go. The other night the Millwall game could’ve gone either way, and I think we drew when I was at QPR, it’s a proper football club as I call it. Old fashioned, fans on top of you, I think Darren Ferguson’s a good manager too. I think Peterborough will upset a few teams. Even with the money-men in the league I think it’s the closest league in a long time this year. And to only have 1 team winning 2 out of 2 shows how close it is I think. I don’t see anybody running away with it for all the money they’ve got. I’ll be very surprised if Peltier doesn’t play. Paul Green’s out; we don’t know how long for yet. The physio says 4-6 weeks, but I multiply that by two. It’s a big blow, losing Green, that’s the difference [between us and the money-men], but I can’t see anything changing before deadline unless the takeover is completed. I think they’ll now be loans from the Premier League when the squads are registered on September 1st. I think there’s a number of good players we can bring in, but financials will dictate that. Is the squad strong enough for the season? No… No, not a cat in hell’s chance. I’m not just saying this to scaremonger, but for example if we went to Peterborough and lost Pearce and Austin, I don’t really know where we’d turn to to be honest. It’d be great for me to sign 3-4 good players on loan or permanently, I know it would. But it’s not to be. As a manager all you can do is do your best, try and put a team out that’s going to give everything. Try to get every ounce of energy out of every player. When you don’t get that, that disappoints me a little bit, that’s why I was disappointed with our front lads at Blackpool, because I thought the rest of the team warranted a little bit more from them. But that’s how it is, I’ve got to look at whether it’s because they can’t do it twice in 3-4 games, the lads we’ve talked about. When we play Oxford I will need to play a couple of lads I’ve not seen. Because I want to look at them now. We haven’t got a lot to change, really. We can do little bits and bobs, I’ll probably take young Dominic with us, because he’s done well with the reserves. But we haven’t got anybody else. I’ve asked Neil Redfearn if we have anybody else, of the kids, because I do like forwards on the bench, but unfortunately we haven’t got many at the minute. We’re still talking to [Diouf], I know we made an offer yesterday that they’re mulling over. I don’t think it’s a money situation with him, he’s made a lot over his career really. That’s why I’m saying to him this is the best club for him now, with the crowds and stadium, where’s he going to play that’s better than this at this stage of his life? So I think he’s enjoying every minute really.